Darby Penney is a national leader in the human rights movement for people with psychiatric disabilities and a former state mental health official who has experienced the mental health system inside and out. 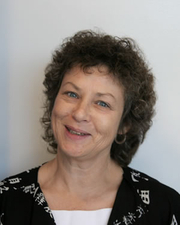 Currently a Senior Research Associate with Advocates for Human Potential, Inc., she was Director of Recipient Affairs at the New York State Office of Mental Health (OMH) from 1992-2001, where she was responsible for bringing the perspectives of people with psychiatric disabilities into the policy-making process. From 2001-2003, she was OMH Director of Historical Projects, where she oversaw the collection of ex-patient oral histories, state hospital cemetery restoration, and the Willard Suitcase Project. Darby is president of The Community Consortium, a non-profit group of ex-patients and their allies working to promote community integration for people with psychiatric labels. She was honored for her work promoting the human rights of people with psychiatric histories by being named a 2005 Fellow by the Petra Foundation. She has spoken, published and consulted nationally and internationally on psychiatric disability and rights issues. Darby did an illustrated slide lecture on the Willard suitcase owners at the World Federation for Mental Health Conference in Cairo, Egypt, in 2005. From 1991- 2004, Darby was publisher (and her husband, Ken Denberg, was editor) of The Snail’s Pace Press, a literary small press that published a journal, The Snail’s Pace Review, and books of poetry and short fiction. Her own poetry has been published in a number of journals. Darby Penney is currently considered a "single author." If one or more works are by a distinct, homonymous authors, go ahead and split the author. Darby Penney is composed of 1 name.